Whispers in the Loggia: "Make Us Live In Your 'Today'"
"Make Us Live In Your 'Today'"
Qui, pridie quam pro nostra omniumque salute pateretur, hoc est hodie, accepit panem: [He who, the day before he suffered for the salvation of us and of all -- that is, today -- took bread:] these words we shall pray today in the Canon of the Mass. “Hoc est hodie” ["That is, today"] – the Liturgy of Holy Thursday places the word “today” into the text of the prayer, thereby emphasizing the particular dignity of this day. It was “today” that He did this: he gave himself to us for ever in the Sacrament of his Body and Blood. This “today” is first and foremost the memorial of that first Paschal event. Yet it is something more. With the Canon, we enter into this “today”. Our today comes into contact with his today. He does this now. With the word “today”, the Church’s Liturgy wants us to give great inner attention to the mystery of this day, to the words in which it is expressed. We therefore seek to listen in a new way to the institution narrative, in the form in which the Church has formulated it, on the basis of Scripture and in contemplation of the Lord himself. The first thing to strike us is that the institution narrative is not an independent phrase, but it starts with a relative pronoun: qui pridie. This “qui” connects the entire narrative to the preceding section of the prayer, “let it become for us the body and blood of Jesus Christ, your only Son, our Lord.” In this way, the institution narrative is linked to the preceding prayer, to the entire Canon, and it too becomes a prayer. By no means is it merely an interpolated narrative, nor is it a case of an authoritative self-standing text that actually interrupts the prayer. It is a prayer. And only in the course of the prayer is the priestly act of consecration accomplished, which becomes transformation, transubstantiation of our gifts of bread and wine into the Body and Blood of Christ. As she prays at this central moment, the Church is fully in tune with the event that took place in the Upper Room, when Jesus’ action is described in the words: “gratias agens benedixit – he gave you thanks and praise”. In this expression, the Roman liturgy has made two words out of the one Hebrew word berakha, which is rendered in Greek with the two terms eucharistía and eulogía. The Lord gives thanks. When we thank, we acknowledge that a certain thing is a gift that has come from another. The Lord gives thanks, and in so doing gives back to God the bread, “fruit of the earth and work of human hands”, so as to receive it anew from him. Thanksgiving becomes blessing. The offering that we have placed in God’s hands returns from him blessed and transformed. The Roman liturgy rightly interprets our praying at this sacred moment by means of the words: “through him, we ask you to accept and bless these gifts we offer you in sacrifice”. All this lies hidden within the word “eucharistia”. There is another aspect of the institution narrative cited in the Roman Canon on which we should reflect this evening. The praying Church gazes upon the hands and eyes of the Lord. It is as if she wants to observe him, to perceive the form of his praying and acting in that remarkable hour, she wants to encounter the figure of Jesus even, as it were, through the senses. “He took bread in his sacred hands …” Let us look at those hands with which he healed men and women; the hands with which he blessed babies; the hands that he laid upon men; the hands that were nailed to the Cross and that forever bear the stigmata as signs of his readiness to die for love. Now we are commissioned to do what he did: to take bread in our hands so that through the Eucharistic Prayer it will be transformed. At our priestly ordination, our hands were anointed, so that they could become hands of blessing. Let us pray to the Lord that our hands will serve more and more to bring salvation, to bring blessing, to make his goodness present! From the introduction to the Priestly Prayer of Jesus (cf. Jn 17:1), the Canon takes these words: “Looking up to heaven, to you his almighty Father …” The Lord teaches us to raise our eyes, and especially our hearts. He teaches us to fix our gaze upwards, detaching it from the things of this world, to direct ourselves in prayer towards God and thus to raise ourselves. In a hymn from the Liturgy of the Hours, we ask the Lord to guard our eyes, so that they do not take in or cause to enter within us “vanitates” – vanities, nothings, that which is merely appearance. Let us pray that no evil will enter through our eyes, falsifying and tainting our very being. But we want to pray above all for eyes that see whatever is true, radiant and good; so that they become capable of seeing God’s presence in the world. Let us pray that we will look upon the world with eyes of love, with the eyes of Jesus, recognizing our brothers and sisters who need our help, who are awaiting our word and our action. Having given thanks and praise, the Lord then breaks the bread and gives it to the disciples. Breaking the bread is the act of the father of the family who looks after his children and gives them what they need for life. But it is also the act of hospitality with which the stranger, the guest, is received within the family and is given a share in its life. Dividing (dividere), sharing (condividere) brings about unity. Through sharing, communion is created. In the broken bread, the Lord distributes himself. The gesture of breaking also alludes mysteriously to his death, to the love that extends even to death. 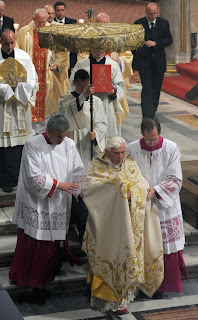 He distributes himself, the true “bread for the life of the world” (cf. Jn 6:51). The nourishment that man needs in his deepest self is communion with God himself. Giving thanks and praise, Jesus transforms the bread, he no longer gives earthly bread, but communion with himself. This transformation, though, seeks to be the start of the transformation of the world – into a world of resurrection, a world of God. Yes, it is about transformation – of the new man and the new world that find their origin in the bread that is consecrated, transformed, transubstantiated. We said that breaking the bread is an act of communion, an act of uniting through sharing. Thus, in the act itself, the intimate nature of the Eucharist is already indicated: it is agape, it is love made corporeal. In the word “agape”, the meanings of Eucharist and love intertwine. In Jesus’ act of breaking the bread, the love that is shared has attained its most radical form: Jesus allows himself to be broken as living bread. In the bread that is distributed, we recognize the mystery of the grain of wheat that dies, and so bears fruit. We recognize the new multiplication of the loaves, which derives from the dying of the grain of wheat and will continue until the end of the world. At the same time, we see that the Eucharist can never be just a liturgical action. It is complete only if the liturgical agape then becomes love in daily life. In Christian worship, the two things become one – experiencing the Lord’s love in the act of worship and fostering love for one’s neighbour. At this hour, we ask the Lord for the grace to learn to live the mystery of the Eucharist ever more deeply, in such a way that the transformation of the world can begin to take place. After the bread, Jesus takes the chalice of wine. The Roman Canon describes the chalice which the Lord gives to his disciples as “praeclarus calix” (the precious cup), thereby alluding to Psalm 23 , the Psalm which speaks of God as the Good Shepherd, the strong Shepherd. There we read these words: “You have prepared a banquet for me in the sight of my foes … My cup is overflowing” – calix praeclarus. The Roman Canon interprets this passage from the Psalm as a prophecy that is fulfilled in the Eucharist: yes, the Lord does indeed prepare a banquet for us in the midst of the threats of this world, and he gives us the glorious chalice – the chalice of great joy, of the true feast, for which we all long – the chalice filled with the wine of his love. The chalice signifies the wedding-feast: now the “hour” has come to which the wedding-feast of Cana had mysteriously alluded. Yes indeed, the Eucharist is more than a meal, it is a wedding-feast. And this wedding is rooted in God’s gift of himself even to death. In the words of Jesus at the Last Supper and in the Church’s Canon, the solemn mystery of the wedding is concealed under the expression “novum Testamentum”. This chalice is the new Testament – “the new Covenant in my blood”, as Saint Paul presents the words of Jesus over the chalice in today’s second reading (1 Cor 11:25). The Roman Canon adds: “of the new and everlasting covenant”, in order to express the indissolubility of God’s nuptial bond with humanity. The reason why older translations of the Bible do not say Covenant, but Testament, lies in the fact that this is no mere contract between two parties on the same level, but it brings into play the infinite distance between God and man. What we call the new and the ancient Covenant is not an agreement between two equal parties, but simply the gift of God who bequeaths to us his love – himself. Certainly, through this gift of his love, he transcends all distance and makes us truly his “partners” – the nuptial mystery of love is accomplished. In order to understand profoundly what is taking place here, we must pay even greater attention to the words of the Bible and their original meaning. Scholars tell us that in those ancient times of which the histories of Israel’s forefathers speak, to “ratify a Covenant” means “to enter with others into a bond based on blood or to welcome the other into one’s own covenant fellowship and thus to enter into a communion of mutual rights and obligations”. In this way, a real, if non-material form of consanguinity is established. The partners become in some way “brothers of the same flesh and the same bones”. The covenant brings about a fellowship that means peace (cf. ThWNT II, 105-137). Can we now form at least an idea of what happened at the hour of the Last Supper, and what has been renewed ever since, whenever we celebrate the Eucharist? God, the living God, establishes a communion of peace with us, or to put it more strongly, he creates “consanguinity” between himself and us. Through the incarnation of Jesus, through the outpouring of his blood, we have been drawn into an utterly real consanguinity with Jesus and thus with God himself. The blood of Jesus is his love, in which divine life and human life have become one. Let us pray to the Lord, that we may come to understand ever more deeply the greatness of this mystery. Let us pray that in our innermost selves its transforming power will increase, so that we truly acquire consanguinity with Jesus, so that we are filled with his peace and grow in communion with one another. Now, however, a further question arises. In the Upper Room, Christ gives his Body and Blood to the disciples, that is, he gives himself in the totality of his person. But can he do so? He is still physically present in their midst, he is standing in front of them! The answer is: at that hour, Jesus fulfils what he had previously proclaimed in the Good Shepherd discourse: “No one takes my life from me: I lay it down of my own accord. I have power to lay it down and I have power to take it again …” (Jn 10:18). No one can take his life from him: he lays it down by his own free decision. At that hour, he anticipates the crucifixion and resurrection. What is later to be fulfilled, as it were, physically in him, he already accomplishes in anticipation, in the freedom of his love. He gives his life and he takes it again in the resurrection, so as to be able to share it for ever. Lord, today you give us your life, you give us yourself. Enter deeply within us with your love. Make us live in your “today”. Make us instruments of your peace! Amen. "I Consecrate Myself... I Sacrifice Myself"
"I Ask You, The Church Asks You, For Forgiveness"